Hut, hut, hike! Who is that handsome quarterback scoring the final touchdown? It’s me, Eli! 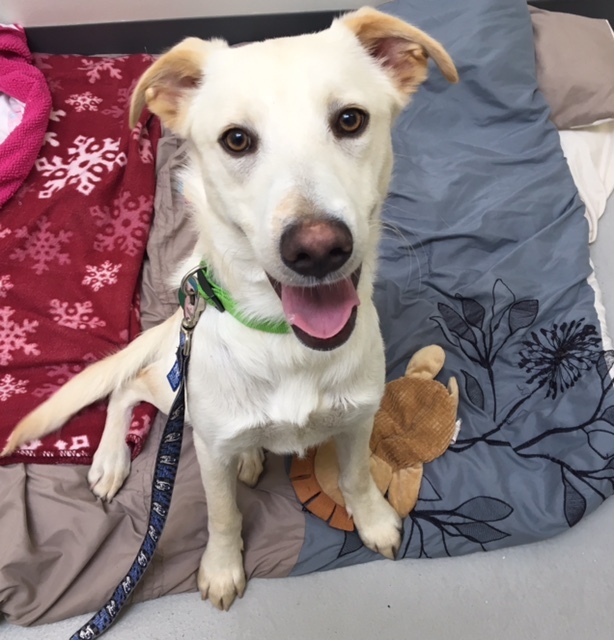 Named after my favorite football player, I am a 1.5 year old, 41 lb Yellow Lab mix with charming and playful personality. When I am not playing fetch or wrestling around with my puppy pals, I am tackling you with kisses! I am very affectionate, fun, and goofy guy and love to meet everyone of all ages, all breeds, and all species (even those kitties too!). I would just love to have another doggy team member in the home to have lots of fun with! I am super smart and with some help from you, I could learn some more drills and practice some new plays in my new home that is owned by my adopters. As long as there is a yummy trophy awaiting me! Whether we are playing the sport or snuggling on the couch watching it on TV, I am a happy camper. Spring training is over and it’s time to put me in the game! Will you be on my team? Fill out an application today, so we can play! I come to you micro-chipped, neutered, and vaccinated with an adoption fee of $300.